In 2015, Canada Day fell in the middle of Ramadan (the most sacred month of the lunar Islamic calendar) for the first time in about thirty years. The last time that happened, the Muslim population of Canada numbered just around 100,000 people (about 0.38% of the Canadian population at that time). 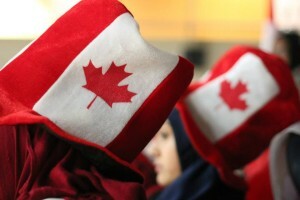 Today, there are over 1.1 million Muslims living in Canada (about 3.1% of the total population). Islam is second only Christianity in the number of Canadians who self-identify with a faith-tradition, and Muslims make up the fastest-growing religious community in Canada. Both the faith and its followers figured prominently in Canada’s recent federal election campaign. Over half a million Muslims were eligible to vote, and in many important political constituencies Muslims make up more than 10% of the population. Politicians have taken note of this: former PM Stephen Harper hosted an iftār at his official residence earlier this year, and current PM Justin Trudeau has done everything from speaking at Toronto’s annual Reviving the Islamic Spirit (RIS) Convention, which attracts scholars and visitors from around the world, to choosing a Muslim women to be his government’s Minister of Democratic Institutions. Canadian Muslims are diverse – they come from South Asia, the Middle East, Eastern Europe, and sub-Saharan Africa, and speak many languages, including Arabic and Urdu. And they are very educated: 44% of Canadian Muslims aged 25-64 have a university degree (compared to 26% of the Canadian population in general), 15% have a graduate degree, and almost 14,000 (more than 1.3% of the Canadian Muslim population) have a doctorate degree. Muslims have served in the police force, the military and the RCMP, nine Muslims are currently Members of Parliament (a Canadian record!) and one is currently the mayor of Calgary, Alberta. They’ve even had their own television sitcom, Little Mosque on the Prairie, which aired from 2007 to 2012 on CBC. Most Muslims live in major cities such as Toronto, Montreal and Vancouver, but smaller communities can also be found in towns and cities across Canada. In recent years, Muslim communities have started to grow in Northwest Territories and Nunavut as well. It’s clear from all this that the Muslim community has grown and developed significantly in recent years, and seems poised to continue to do so in the near future. But this can be misleading, because it can be seen as implying that the Canadian Muslim community (or Muslims’ presence in Canada) is new, young, a recent phenomenon. In reality, Muslims and their faith, Islam, have been around in Canada for a very long time – longer, in fact, than Canada itself has existed! The earliest Muslims in Canada may have been slaves from West Africa who were brought to British North America (as Canada was known back in the day) in the transatlantic slave trade, sometime before slavery was abolished in the British Empire in 1833. But no records of Muslims or the practice of Islam among West African slaves have survived, so this is just speculation. The first recorded Muslims in Canadian history were James and Agnes Love, a young couple who had apparently converted to Islam in their native Scotland before they migrated to Canada in 1854, settling in Ontario. These “Mohametans” had several children, including James, who was born just after their arrival. Their youngest son Alexander was born in 1868, one year after Confederation, and secured his spot in history as the first recorded Muslim born in Canada as we know it today. Another young couple of European origins, John and Martha Simon, had also embraced Islam in the United States, where they were born and raised. They migrated to Canada in 1871, bringing the total number of known Canadian Muslims at the time to 13. The population of Muslims in Canada increased very slowly at this stage, but even then, some Muslim labourers managed to partake in another important event in Canadian history – building the Canada Pacific Railway linking British Columbia to the rest of the country. By 1901, there were 47 Muslims in Canada, spread all over the country (except for the Atlantic/Maritime provinces). Most of them were immigrants, particularly attracted by the land available for agriculture and settlement in the Prairies (Manitoba, Saskatchewan and Alberta). They came mostly from Syria, Lebanon, Turkey, Albania and Yugoslavia (all then part of the Ottoman Empire), but also from the United States. Some were also attracted by the famous Klondike Gold Rush between 1877 and 1899, and may have even taken part in it – at least one young Lebanese man is recorded to have landed in Montreal with that intention, but he was too late and instead became a successful entrepreneur in that city. The Muslim population of Canada continued to grow quickly, reaching 797 in 1911 before suffering a sharp decline over the next twenty years. The decline was due mostly to the fact that immigrants, upon arriving in Canada, often realized that there were better opportunities in the United States – especially in the 1930s as the Great Depression hit – and resettled there instead. Another contributing factor was the racism they experienced in parts of Canada, especially in British Columbia, where they often found the local population unwelcoming. Nevertheless, more concentrated Muslim communities continued to grow in this period, particularly in cities, as many Muslims started to leave agriculture for professional/industrial jobs or business. Thus by 1921 there were more Muslims in Nova Scotia than in all of Quebec, and in Edmonton, Al-Rashid Mosque, the first mosque in Canada, opened on December 12, 1938 and was inaugurated by Abdullah Yusuf Ali, that famous translator of the Qur’an into English. At the time, there were only about 700 Muslims in Canada. By 1952, when the renowned Islamic Studies program at McGill University in Montreal was inaugurated, there were about two thousand Muslims in the country. In 1955, Ontario’s first mosque was opened in London by a few Lebanese Muslim families, some of whom had lived in London since 1901. Toronto’s first mosque, the Bosnian Islamic Center, opened in 1973, complete with an Ottoman-style minaret – the first minaret in Ontario. In 1982, the first madrassah (traditional Islamic school/seminary) in Canada was established in Cornwall, Ontario, by Mazhar Alam at the instructions of his teacher, the famous Deobandi and Tablighi scholar Muhammad Zakariyya Khandhelvi. Themadrassah attracted students from both Canada and the United States, and its most prominent graduate was Sheikh Muhammad Alshareef, who graduated in 1990 and later founded AlMaghrib Institute. Both the Baby Boom in the 1950s and an open-door immigration policy by the Canadian government starting in the 1960s led to a considerable increase in the Muslim population of Canada – 100,000 in the mid-1980s, more than 500,000 by the turn of the century in 2000, and more than 1.1 million today. On November 10, 2010, the first mosque in the Canadian Arctic officially opened in Inuvik, Northwest Territories. This new mosque is about 1200 miles northeast of Edmonton, Alberta, where the Al-Rashid Mosque had opened 74 years earlier. The Muslims community in Inuvik has grown so large that, after English and French, Arabic is the most spoken language in the Northwest Territories. In nearby Nunavut, where many in the Aboriginal communities have reportedly embraced Islam in recent years, the first mosque is being built in Iqaluit. Though the Muslim community in Nunavut still consists of only about 100 people, this number is expected to quadruple in the next twenty years. So yes, Muslims have been calling Canada their home for at least 161 years now. As a subcultural religious community, they have made many positive contributions to Canadian society, embracing many Canadian values while continuing to proudly embrace and practice their faith and traditions within Canada’s multicultural milieu. Since that fateful day in 1854 when a young James Love and his wife Agnes stepped off their ship from Scotland onto Canadian soil, the Canadian Muslim community has grown, diversified, and achieved far more than they could have ever imagined. 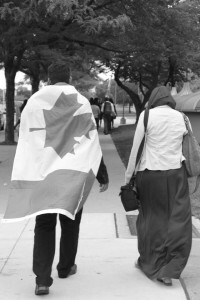 It is up to the Canadian Muslim community of today – and particularly the youth, many of whom are Canadian-born – to carry this legacy forward by continuing to embrace the best of Canadian culture and values while proudly and actively practicing Islam – and tackling any obstacles they may face that try to undermine either of these two components of their identity. — Original post found on Hassam’s blog: Islamic History Review. 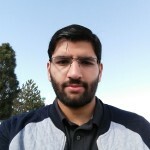 Hassam is a university student, blogger, and independent researcher of Islamic history based in Toronto. To read more his work, visit http://www.ihistory.co/.